The sun sank like a dull-glowing copper ball into a lake of fire. The blue of the sea merged with the blue of the sky, and both turned to a soft dark velvet, clustered with stars and the mirrors of stars. Olivia reclined in the bows of the gently rocking boat, in a state dreamy and unreal. She experienced an illusion that she was floating in midair, stars beneath her as well as above. Her silent companion was etched vaguely against the softer darkness. There was no break or falter in the rhythm of his oars; he might have been a fantasmal oarsman, rowing her across the dark lake of Death. Great and terrible flesh-eating beasts have always shared landscape with humans. They were part of the ecological matrix within which Homo sapiens evolved. They were part of the psychological context in which our sense of destiny as a species arose. They were part of the spiritual systems that we invented for coping. The teeth of big predators, their claws, their ferocity and their hunger, were grim realities that could be eluded but not forgotten. Every once in a while, a monstrous carnivore emerged like doom from a forest or river to kill someone and feed on the body. It was a familiar sort of disaster–like auto fatalities today–that must have seemed freshly, shockingly gruesome each time, despite the familiarity. and it conveyed a certain message. Among the earliest forms of human self-awareness was the awareness of being meat. 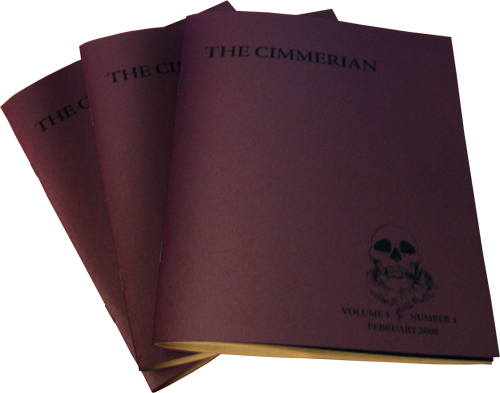 The February 2008 issue has shipped to subscribers. For a sneak peek at all of the treasures contained within, go here. Amethyst is the color this year, a sort of royal gemstone purple that shimmers nicely under a reading lamp. Our artist for the forthcoming annum is Ms. Socar Myles of Vancouver, British Columbia, whose macabre talents can be gleaned at her website. Slipcases for both V4 and V5 will be ready soon (price: $50 ea. ), along with much else. 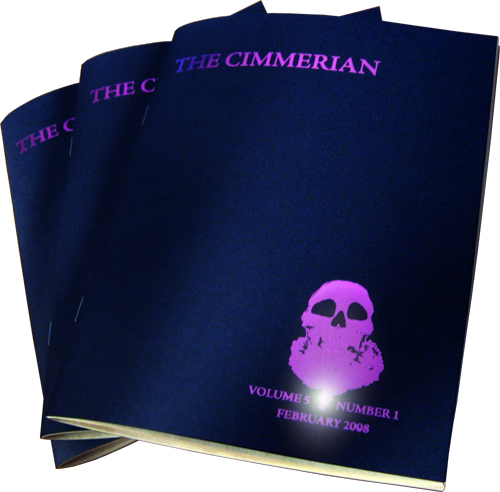 Stay tuned to The Cimmerian Blog for details. The new movie Jumper was tops at the box office last week. Strangely enough, thanks to a quirk of fate, the film has a tenuous REH connection. 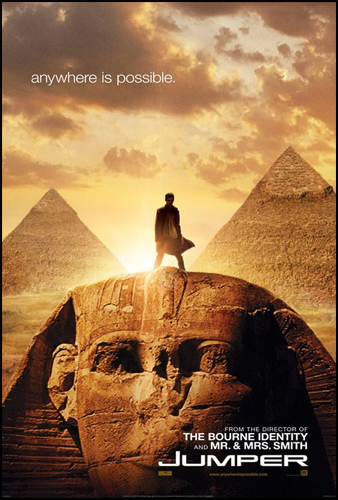 At the 2006 World Fantasy Con, I sat on a REH panel with Glenn Lord and Steven Gould, who is the author of the original novel Jumper on which the movie is based. The guy who was supposed to host the panel never showed up, and Steven was called in at the last minute as a substitute moderator. In the end this was fortuitous, for although he confessed to knowing next to nothing about Robert E. Howard, Steven had taken the logical step of reading Howard’s Wikipedia entry before heading up on stage, which allowed him to ask decent questions and otherwise do a good job. He also demonstrated a general sympathy and interest towards the subject that was well received by the audience (in contrast, several other popular authors embarrassed themselves on Howard panels by their boorish statements). If you’re familiar with the World Fantasy Convention, you know how rare considerate panel behavior can sometimes be. In the worst cases you’re apt to meet panelists who proudly know nothing about the subject they’ve been assigned to discuss, and who then proceed to drown the audience in ignorance and self-appreciation. I was profoundly grateful that I had lucked into such a stellar moderator that day, and it’s nice to see the karmic circle now completing with the recent success of the movie version of his book. If you read Steven’s blog, you can tell how much of a wild head-trip his Hollyweird experience has been, and doubtless that initial break will further his life and career in ways he had never dreamed of. Like he says in one post of his blog, it was like winning the lottery. Good for him. SYDNEY, Australia (AP) — Scientists investigating the icy waters of Antarctica said Tuesday they have collected mysterious creatures including giant sea spiders and huge worms in the murky depths. Australian experts taking part in an international program to take a census of marine life in the ocean at the far south of the world collected specimens from up to 6,500 feet beneath the surface, and said many may never have been seen before. Some of the animals far under the sea grow to unusually large sizes, a phenomenon called gigantism that scientists still do not fully understand. The specimens were being sent to universities and museums around the world for identification, tissue sampling and DNA studies. “Not all of the creatures that we found could be identified and it is very likely that some new species will be recorded as a result of these voyages,” said Graham Hosie, head of the census project. Three ships — Aurora Australis from Australia, France’s L’Astrolabe and Japan’s Umitaka Maru — returned recently from two months in the region as part of the Collaborative East Antarctic Marine Census. The work is part of a larger project to map the biodiversity of the world’s oceans. The French and Japanese ships sought specimens from the mid- and upper-level environment, while the Australian ship plumbed deeper waters with remote-controlled cameras. Among the bizarre-looking creatures the scientists spotted were tunicates, plankton-eating animals that resemble slender glass structures up to a yard tall “standing in fields like poppies,” Riddle said. 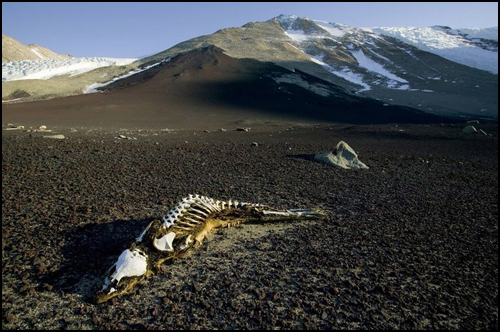 Scientists are planning a follow-up expedition in 10 to 15 years to examine the effects of climate changes on the region’s environment. 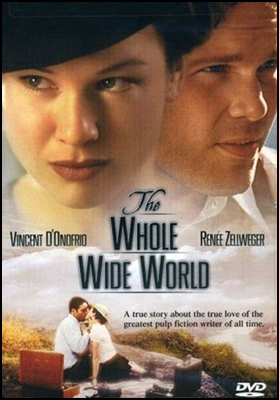 Just thought I would let you know that the first ever U.K. DVD release of The Whole Wide World just went on sale today, Feb 18. It’s available from Amazon U.K. The movie never received a theatrical release over here and Howard fans simply had to make do with taped versions from the handful of TV showings which turned up at (very) odd times. Maybe REH completists might like to know of this potential acquisition. It’s a shame there’s no extras or commentary, though, especially as the case depicts what appears to be a deleted scene. So this release at 107 minutes is comparable to the US release currently in general circulation at 106 minutes, albeit without the commentary and extras. Someday we’ll get a deluxe edition with the deleted scenes (of which there are more than have ever been seen on any format — Michael Scott Myers once told me that the long scene filmed with REH and Novalyne arguing about racism is a real highlight). For those who haven’t heard, the Random House website (and Amazon) are both listing this as being released on October 28, 2008. The book is set to have 400 pages and sell for a retail price of $18. No word on whether it will be illustrated and/or by whom, or what the final contents will be. AND FOR THE RECORD: Conan the Phenomenon (p. 139) calls this book simply Robert E. Howard’s Horror Stories — no Complete, but no Selected either. Phenomenon also says that Greg Staples is set to illustrate it (an English comic book artist who also has done some concept art for the forthcoming Solomon Kane film). 1. 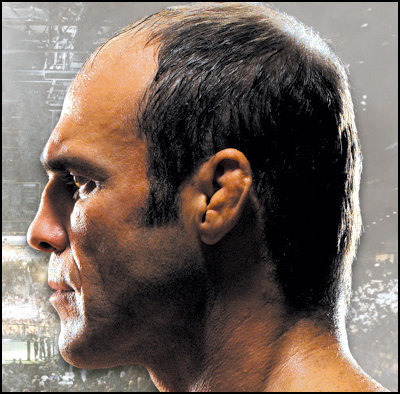 An ear that is swollen, hardened, and deformed from extravasation of blood following repeated blows, resulting in an irregular thickening of scar tissue. Common among boxers. He was hairy and his muscles swelled like iron all over him, miner’s style, and his naturally hard face hadst not been beautified by a broken nose and a cauliflower ear. Altogether, Biff looked like what he was — a rough and ready fighting man.